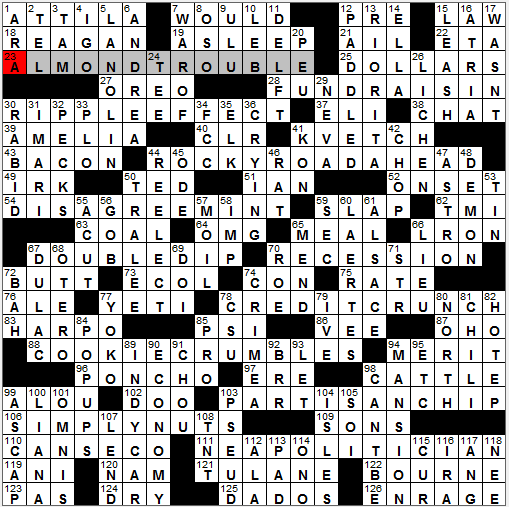 So, Sunday is April Fools Day, and I’m expecting super-tricky crossword themes. What do we get from the NYT? A Merrell theme in which regular phrases are interpreted as if they have something to do with golf (as each phrase includes a word with a golf meaning). I don’t know about you, but this is not the sort of theme that stirs my heart. I got quite drowsy while solving the puzzle, but perked up in alertness once I was done. 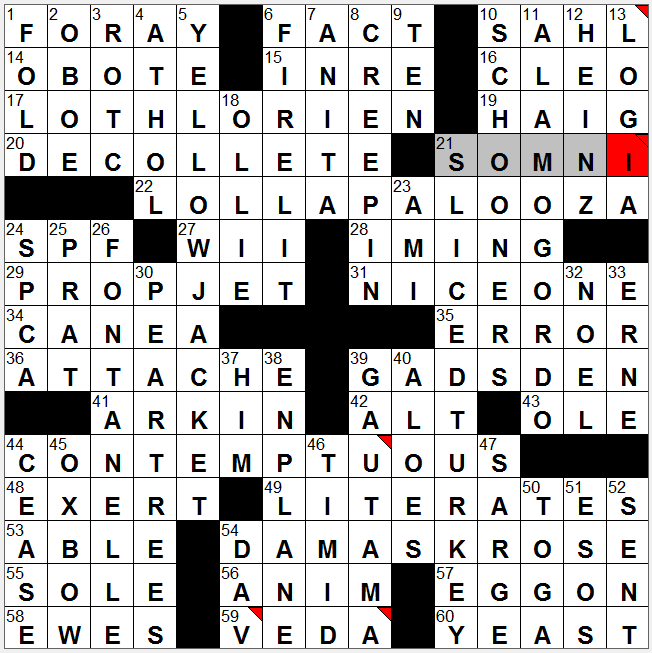 I’m afraid if I rekey all the theme answers, I will nod off mid-post, and we can’t have that. Okay, so a number of the theme answers, putting aside their application here to the sphere of golf, are lively phrases. STROKE OF LUCK, BYE BYE BIRDIE, A CHIP OFF THE OLD BLOCK, PUTTER AROUND, BACK-SEAT DRIVERS, and FOREPLAY would all be fresh language in a themeless puzzle. Six-legged highlight: The clue for 53a: LADYBUG, [Insect named for the Virgin Mary]. Ten-legged lowlight: 4d: [Terrestrial decapod], a LAND CRAB. Have I heard of such a creature? Let me check on that giant crazy crab and see if it’s called a LAND CRAB. Hmm, I’ve Googled and I can’t find the video I remember seeing, but I think it showed another giant robber crab, which is indeed a LAND CRAB. 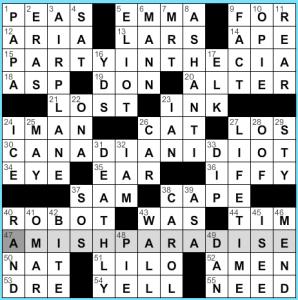 LAND GRAB would’ve been livelier but it’s hard to change an answer that crosses two theme answers plus three 7- or 8-letter entries. Mystery arts answer: 93d: RIENZI, [Early Wagner opera]. All crossings for me, I’m afraid. I mangled the end of 74d: KRONOR, [Swedish coins], which is ridiculous because there’s a Swedish restaurant in Chicago called Tre Kronor with an insanely delicious maple-pecan Danish (but how can a Danish be Swedish, I ask you?) so I should have nailed that. I like the ONCE-OVER and ALI BABA, but those golf clues nearby are making me woozy. 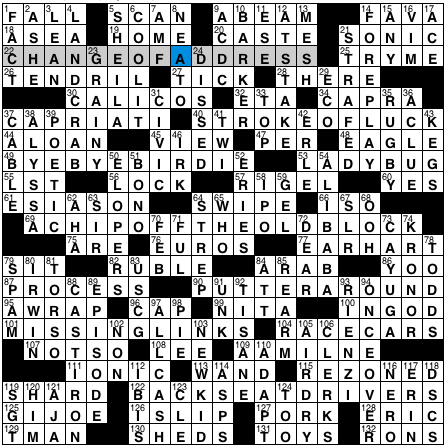 Signing off—four stars because nothing’s wrong with the puzzle, but I kind of want to dock it two stars for nearly putting me to sleep so early in the evening. This puzzle has everything I hate. 1) E’s. The letter E is way overused. I am going to ignore all words with an E in it. 2) Symmetry. Boring! Let’s see a creative grid for once. 3) No theme. Without a theme you just have random words crossing. Who likes that? 5) Wrong Pointer Sister references. Everyone knows, June, not 7D. [One of the Pointer Sisters] – ANITA, is the one that deserves to be included. 6) Made up book names: 54D. [“Captain Underpants and the Perilous Plot of Professor Poopypants” author Pilkey] – DAV. I rate this One Fool. 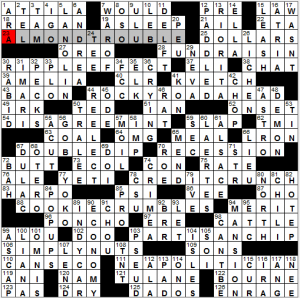 Merl Reagle crossword solution, 4 1 12 "Today's Ice Cream Flavors"
Wait, what? 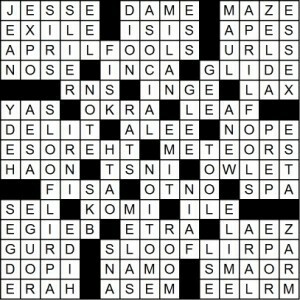 Yet another crossword with no April Fools Day trickery? Must we rely on Jeffrey for all such shenanigans? It’s a damn shame when America has to outsource its shenanigans to a Canadian. 28a. FUND RAISIN’, [Ice cream flavor for campaign workers?]. Heard an interesting segment on public radio this afternoon about the way super-PACs and lobbyist money defile Congress. Pun obvious. 30a. RIPPLE EFFECT, [Ice cream flavor that’ll eventually spread to Europe?]. Instead of fudge, the ripple is made of butterfly wings. Uh, no sound pun here. 44a. ROCKY ROAD AHEAD, [Ice cream flavor for travelers?]. No! Travelers want to eat Smooth Road Ahead ice cream. No sound pun here, either. 54a. DISAGREE MINT, [Ice cream flavor for protesters?]. I like this one, a pun on “disagreement.” I hope it has chocolate chips. You won’t fight me on that, will you? 67a, 70a. DOUBLE-DIP RECESSION, [reason for an increase in ice cream sales?]. Rationale for the puzzle? 78a. CREDIT CRUNCH, [Ice cream flavor for borrowers?]. No sound pun. 106a. SIMPLY NUTS, [Ice cream flavor inspired by the U.S. Tax Code?]. No idea here. The tax code is simply nuts? Is there an existing ice cream flavor called Simply Nuts? Is this a pun on something that sounds like “simply nuts”? I have now written”nuts” too many times. 111a. NEAPOLITICIAN, [Ice cream flavor for voters who like three choices?]. Nice. Choc/van/straw as a three-party race. Did I tell you guys about the Italian restaurant whose menu was offering “New Neoplotian Pizza”? I liked the old Plotian style better, frankly. 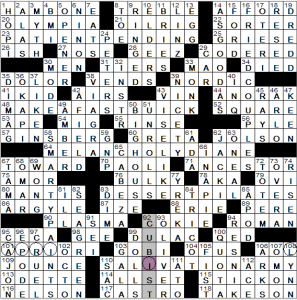 Nominee for clue of the year: 43a: [Strips in a club?] for the BACON in a club sandwich. Well, I can either look at this 70/34 Sunday Challenge as a learning experience or a complete slog. Fill like ATT, INDS, STDS (not even the interesting ones!) crossing SSNS, MEAS, STETHO, ERST, ETONS, and SLRS is just depressing. Throw in a bunch of things I don’t know and it can be a recipe for a ho-hum solve. One Joseph PAPP is the [New York Shakespeare Festival founder]. There was a contest to see who could form the first such festival, and Papp smeared the competition. To be RENASCENT is to be [Showing renewed vigor]. I hope to be renascent by tomorrow. I’ve heard of PAGLIACCI, but I didn’t know it’s an [Opera often paired with “Cavalleria Rusticana”]. Here in Seattle, Pagliacci is the name for a mildly successful local pizza chain. So now I’m craving a slice of pizza all of a sudden. 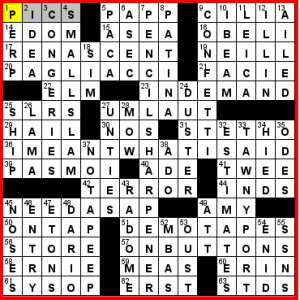 PAS MOI is [D’Artagnan’s denial], which I’m taking to mean “not me” (obviously, my knowledge of French is limited to crosswords, French dressing, French fries, French toast, and French kissing–in declining order of experience, alas). CONGERIES means [Aggregation]. Somewhere in this world, I’m sure, there are congeries of conger eels, all congregating in the same spot. Despite my insisting three times that the [South American rodent] had to be a RATO, it was a PACA. A TAWNY PORT is a [Sweet wine]. I’m just not a wine guy, so I probably never stood a chance with this one. A RADOME is “a structural, weatherproof enclosure that protects a microwave or radar antenna.” Think “radar-dome.” Here, it was clued as [Antenna cover]. I shouldn’t leave you with the impression that there was nothing to celebrate in this puzzle. I MEANT WHAT I SAID is a nice entry, and I also liked SMALL SLAM, PENCIL SHARPENER, NEED ASAP, NOT A PEEP, and CONFETTI. Overall, though, it was quite the learning experience. 15a. PARTY IN THE C.I.A., [“Weird Al” Yankovic parody of a Miley Cyrus song]. Substitute “U.S.A.” for “C.I.A.” to get the original song (which I find unlistenable). You can find the Weird Al version on YouTube yourself; I’ve never heard it. 30a. CANADIAN IDIOT, [“Weird Al” Yankovic parody of a Green Day song]. Here’s “American Idiot.” I don’t know the parody version. 47a. AMISH PARADISE, [“Weird Al” Yankovic parody of a Coolio song]. “Gangsta’s Paradise” is the original. Here’s the parody video. Your assignment is to write a five-paragraph essay comparing and contrasting the two videos. The essay is due the Monday after spring break. Enjoy the rest of your April Fools Day, everyone! Talk about confusing! 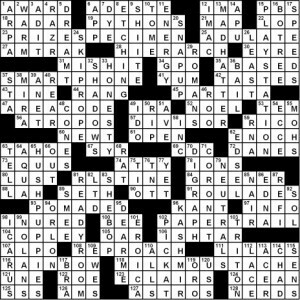 This puzzle appeared in print six weeks ago, on February19, but is dated on-line as April 1, and has a title that starts with “May I”. How foolish! But seriously: base phrases receive an injection—or infusion?—of the letter I to create a new, wacky version. I suppose ‘insertion’ is aptest. 23a. [One in the doctor’s waiting room?] PAT(I)ENT PENDING. Very good, but the only themer with an additional I, if that sort of thing is important. 48a. [Soup up a Regal?] MAKE A FAST BU(I)CK. Not Merl. 64a. [Somber Sawyer?] MELANCHOLY D(I)ANE. I.e., Hamlet. One would hope not portrayed by a HAMBONE (1a). 83a. [How to burn off calories from a cake?] DESSERT P(I)LATES. Erm. 110a. [Drooling soldiers?] SAL(I)VATION ARMY. C’mon, how many of us hadn’t already thought of that one about a zillion times? Still amusing, though. 16d. [Duos in the hot, hot sun?] FR(I)ED COUPLES. Just in case you weren’t fed up with golf after the NYT. 58d. [Genius creates art?] SMARTY PA(I)NTS. Hm. sounds like intelligent design? Good construction, fairly Scrabbly fill. Makes for a solid puzzle. Certainly would be unreasonable to expect the non-theme parts of the grid to be lipogrammatic regarding the ninth letter of the alphabet, so no complaints there. I solved this last night, and I have to confess that not much about it, good or bad, stands out in my memory, so I’d call it an average, unremarkable puzzle. Quite taken with the mix of letters stacked in the northwest, with HAMBONE and Manet’s OLYMPIA. Not nearly as thrilled by the complement in the southeast, STICK ON sitting on TAKES ON. ON/ON? No, no. 95a [Intestinal parts] CECA. You may have some ameba in your cecum; it’s possible I do too, in which case it would be more than a few amoeba in my caecum. Linguistic factette: 44a [Parka] ANORAK. Both are hooded overcoats found in cultures of the northern latitudes. Parka comes from the Greenland Inuit language while anorak derives from the language of the Samoyedic peoples of Russia. Yes, whence the eponymous dog hails. Smile! Neither culture would be considered NORDIC (39a). Best clue: 99d [They wear little clothing] DOLLS. Robin Stears's syndicated LA Times solution 4/1/12, "Front Money"
Hey, crossword fans. Doug here. No April Fools Day hijinks in the puzzle today. 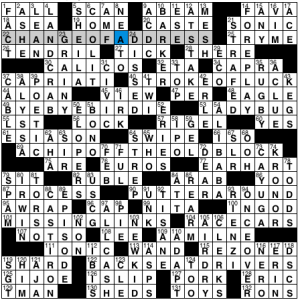 We’ve got eight theme entries that are “fronted” with words that can be precede “money.” The big old dollar sign in the center of the grid is a nice touch. 23a. [Pride of a collection] – PRIZE SPECIMEN. I’ve got a big collection of Polly Pocket action figures (they’re not dolls! ), but it’d be hard for me to pick a favorite. 37a. [Nexus One, for one] – SMARTPHONE. 102a. [Accountant’s creation] – PAPER TRAIL. 118a. [Line in many a dairy ad?] – MILK MOUSTACHE. 13d. [“Why is a raven like a writing desk?” inquirer] – MAD HATTER. Want to know the answer to this riddle? There are lots of possible answers, none of them particularly good. There’s a nice rundown here: The Straight Dope. 15d. [1994 Sony release] – PLAYSTATION. 65d. [Shoes with a basset hound logo] – HUSH PUPPIES. 81d. [Aircraft carrier pilot’s waiting area] – READY ROOM. I’ve never heard of a ready room, and ready money is only vaguely familiar. Perhaps a phrase with BLOOD or SOFT up front would have been better. Before we get to the bullets, I want to introduce you to Anori. Isn’t she the cutest? 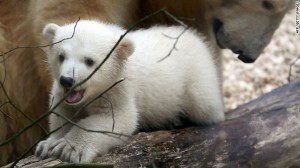 She’s the half-sister of Knut, the polar bear cub at the Berlin Zoo who made the news a few years ago. Besides being adorable, her name is crossword gold. With those common letters & alternating consonants and vowels, ANORI could be huge. Read about her here and let’s spread the word. And please, constructors, don’t use her to build a quint-stack. She’s only three months old. 56a. [Sister of Clotho] – ATROPOS. Tough entry that shows up now and then. Clotho and Atropos, along with their sister Lachesis, were The Fates of Greek mythology. Clotho spun the thread of life, Lachesis measured it, and Atropos cut it when it was time for you to die. Fun bunch of gals. 8d. [Artwork in a cliched come-on] – ETCHING. When I read the clue, I thought it was referring to those “Draw me” ads they used to run in comic books. All you had to do was draw a turtle or a pirate, and you could win a scholarship to art school. Maybe that’s how T Campbell got started. Oh, here’s the explanation for the “etchings” come-on. 16d. [Sacred Indian fig] – BO TREE. That’s the tree under which the founder of Buddhism is reputed to have attained Enlightenment. 62d. [Father of Henry II] – EDSEL. Ha, nice clue. The Ford family. Totally tricked me. When I see names that look like they’re kings or queens, my eyes glaze over, because I know nothing about European royalty. 85d. [“We wear short shorts” brand] – NAIR. 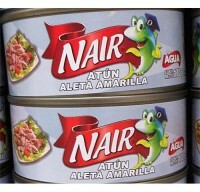 What do short shorts have to do with tuna? 113d. [Maker of Aspire computers] – ACER. Excellent clue for ACER. Not a tennis player to be found. OK, it’s getting late, so you’ll have to figure out the rest yourself. See you next week. The best way to trick someone is to prepare two tricks, so when they unravel the first one and lower their guard you hit them with the second. That’s what happened to me with this month’s Patrick Blindauer website puzzle, where I figured out early that all four theme answers are APRIL FOOLS, and confidently filled them in. Well, the first two were indeed APRIL FOOLS, but the SW and SE ones were SLOOF LIRPA, or that same phrase backwards. But it wasn’t just the theme entries — every answer in the bottom half of the grid must be entered backwards (not exactly the bottom half, but in the 50% of the grid that surround those two backward theme answers). And Patrick ties the forward and backward halves together with double-clued two-way words in the middle section (NOTE/ETON, RATS/STAR, EMIT/TIME and TOOL/LOOT). Favorite clues: [Fall faller] for LEAF, [Pair traffic controller?] 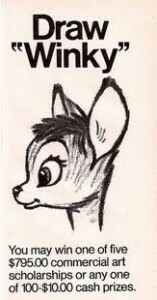 for NOAH (well, for HAON), and [“___ Tonic” (Bugs Bunny cartoon)] for HARE (ERAH). This entry was posted in Daily Puzzles and tagged Henry Hook, Karen M. Tracey, Merl Reagle, Patrick Blindauer, Patrick Merrell, Robin Stears, Trip Payne, William I. Johnston. Bookmark the permalink. 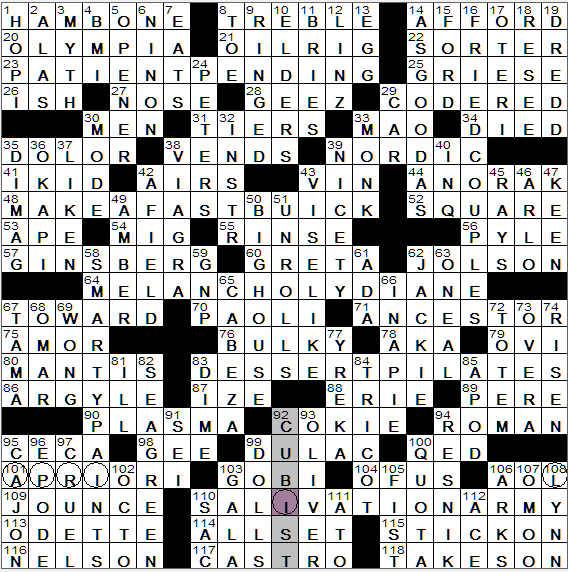 The Yahoo Daily crosswords with named constructors (Berry, Jones, etc.) are typically really good. The fill tends to be super-fresh. They also run some without bylines which are … well, before I disparage them, who writes those? Anyone know? Wow. 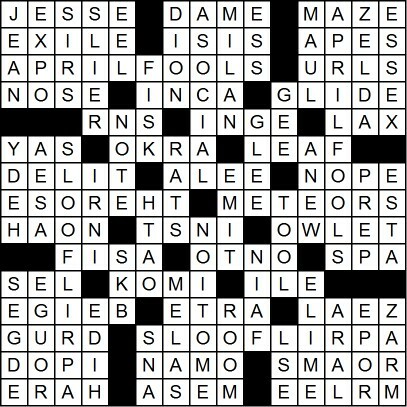 The Matt Jones Yahoo crossword is a masterpiece! Brutal MJ Yahoo puzzle, man had to know a lot of entertainment trivia, to get through that. I would have preferred some questions about George Washington and his preferred mode of transportation during the war. Sam, maybe you’d prefer a Tawny Kitaen to a tawny port? Unfair — Jeffrey’s rant on Karen Tracey’s Puzzler, much too CONTEMPTUOUS… How often do we get the GADSDEN flag or a DAMASK ROSE, FONTANELLE or DECOLLETE, a YELLOW JACKET and ALAMOGORDO? Let alone LALLAPALOOZA! It’s a gem, IMHO! @ArtLvr: Please note today’s date. If you want April Fools shenanigans, how about this? Fabulous clue for MAP in today’s LAT! Also, the clue for EDSEL that Doug already mentioned! I actually live in Paoli, PA, that much-maligned entry in Hex/Hook. Two points: 1) We’re emphatically not a suburb of Chester; most people work in other nearby suburbs or in Philadelphia. 2) We do have a reasonable claim to fame that Hook could have used for cluing — [Site of 1777 “massacre” of Revolutionary troops]. But then again, technically speaking, the “Paoli Massacre” took place next door in Malvern. Nothing personal, Jeff H., but I’m sure you can understand an outsider’s point of view. Now that you mention it, I (very vaguely) recall encountering something about the “Paoli Massacre.” Probably in another crossword. I know Paoli, there’s a curling club there. And I know I’ve heard it in at least one other context. In other words, just as famous as Natick.